In our first two lessons we learned about the home life and educational system of the Jewish people who lived in the Galilee during the time of Jesus. We looked at what training was required to become and be called a Rabbi by the people in your community. Now we will look at what happened to a man after he had completed his apprenticeship and became eligible to receive the title of Rabbi. First of all, a Rabbi during Jesus day was just a teacher; he did not have any official credentials or titles from the government or church. The official title of Rabbi as a trained minister came quite a bit after Jesus’ time. During Jesus’ day, a Rabbi was only recognized for his wisdom or his training, it had nothing to do with book learning or degrees. They were called Torah teachers or teachers of the law. The people who tried to follow and live by their teachings to the utmost were called Pharisees, or the pious ones. The Bible also calls them experts in the law, scribes and sometimes lawyers. They knew and tried to follow the fine points of the law to make sure that they were obedient to God’s commands. Common – not to mean just average, but that there were quite a few of these. They were called Torah teachers because they knew the Torah forwards and backwards and were very good at teaching it. But, they didn’t leave home and take a group and they were limited to teaching students in local situations and could only teach accepted doctrine and couldn’t come up with their own interpretations or new doctrine. Rabbis with s’mekah – There were a very few of these. They were given an unusual stamp of approval as someone so gifted at what they did that they had God’s stamp of approval. Two other rabbis who had s’mekah had to confer this title on you and say that you too, had God’s stamp of approval and that your authority came from God himself. If you had s’mekah you could travel and take a group of talmidim with you (e.g John the Baptizer had s’mekah). You also had the right and authority to make new interpretations of the law because of s’mekah. For example, a Torah teacher would say, “It is written”, or, “Rabbi so and so says”, but the Rabbi with s’mekah would say, “You’ve heard it said, but I say to you” and then give a new and different interpretation of a Law of Moses. Now, what kind of rabbi was Jesus? One with s’mekah! Look at Matthew 7:28-29. Jesus had just finished giving the Sermon on the Mount and the Bible says they were amazed at His teaching, because He taught as one who had authority (s’mekah) and not as their regular Torah teachers. They weren’t amazed because they had never seen this before or that he was so different, but they were amazed that He taught with s’mekah! They were asking, “Where did Jesus get His authority? Where did He get the knowledge to do that kind of teaching? He never studied under anyone around here!”. Jesus was a typical Jewish Rabbi with s’mekah. Where did he get His s’mekah from? Although we can’t know for sure, Scripture seems to indicate that Jesus received his s’mekah from John the Baptist and God (read Matthew 21:23-27)! In our next session we will look at some of Jesus’ actions and some of the stories that show how he acted as a Rabbi with s’mekah. Jesus was often called rabbi by His peers in the stories of the New Testament. In fact, the Gospels record that Jesus was called, ”Rabbi” on sixteen different occasions. What was a rabbi and how did you become one? In our first segment we began our discussion of the Jewish educational system. We learned that the heart of that system were the principles taught at home by the family and especially the father. The father was responsible to teach his son Torah and to teach him a craft as well as almost everything else in life. When the child became old enough to attend a formal school setting, he went to the school that was attached to the local synagogue. There were four levels of school available to the children of the Galilee in Jesus’ day. Let’s take a look at these. Bet Sepher – literally means “The House of the Book” (Torah). This was for boys and girls both and was from age 5-10. 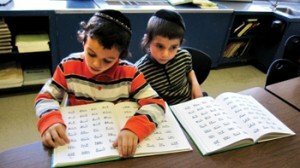 Children would be trained by the local Torah teacher. The class always began with the Book of Leviticus and the students began to memorize the Torah and incorporate math and other subjects all centered around “The Book”. Other passages of Scripture that were studied were the “Shema” (Deuteronomy 6:4-9 and Deuteronomy 11:13-21) and the creation story in Genesis 1-5. By the age of 10, most students had all or huge parts of the first five books of the Bible committed to memory. Remember that they had no text books. Usually there was only one copy of each book of the Bible available in the synagogue. Memorization was done by orally repeating the word over and over, with the teacher leading the recitation. Girls only completed this level of learning. From this age on, they would be training to be a housewife and would be married shortly after. A wonderful tradition that was practiced a little bit later in Jewish history graphically shows the importance the parents placed on this first stage of learning. On the first day of school, when the student went to meet his new teacher and classmates, the parents would wrap their child in a prayer shawl like a scroll. Bet Talmud – literally means, “House of Learning”. If a young man had done well on his memorization of the Torah in Bet Sepher, he would be able to move on to this level. He would expand his Torah study and begin to study the other Old Testament Books. Also, they began studying the Oral Law (Mishnah) at this age. It is interesting to note that before 70 A.D. in Jerusalem alone, their were 480 synagogues that had both the Bet Sepher and Bet Talmud schools. This was usually the last level that most young men would complete. By the age of fourteen or fifteen, they would begin to learn a trade from their father. Most of Jesus’ disciples had finished this level and were now learning a trade (e.g. in Matthew 4:18-22, James and John were learning the fishing trade from their father, Zebedee. Peter and Andrew were also fishing in the same passage.) Only the best and brightest would be able to move on to the next level of learning. Bet Midrash – literally means “House of Study”. At approximately age fifteen, if you had demonstrated great ability in your previous studies, you could now begin to study under some of the great teachers of the law. Theses academies were conducted by the greatest teachers of the time such as Hillel, Shammai, Akeba, and Gamaliel. After completing this very advanced level, you could ask to be a student of and travel with one of these great teachers. Talmidim – literally means “disciple”. If you were accepted as a disciple of one of these rabbis, you were called one of his “Talmidim”. From this point on, you would travel with your wise teacher, desperately trying to become just like him. The idea was not to just know what your teacher knew, but to be what your teacher was. You would leave home and be gone for 30 days at a time. Talmidim that were married had to have written permission from their wives to travel for this length of time. While you were traveling out in the real world, you watched and imitated your rabbi and learned how to react in every situation. This training period usually lasted for fifteen years, after which you would then become a rabbi yourself and have your own Talmidim. During your apprenticeship, you were required to have a trade and weren’t allowed to be paid for any religious teaching. All the great rabbis were also woodcutters (Hillel), surveyors (Shammai), blacksmiths, etc. or leather workers, such as Paul (Acts 18:3). When you think about the story of Jesus in the Gospels, his training probably fit into this pattern. Although the Bible doesn’t give us any specifics of his early life, it certainly gives us some hints. In Luke 2:40 it says that as Jesus grew up He was filled with wisdom. Also, in Luke 2:41-52, it tell the story of Jesus going as a young man to the Temple during the Passover Festival. Jesus went into the temple courts and sat among the teachers, listening to them and asking them questions. Everyone was amazed at His understanding and His questions and answers. Verse 52 says, “Jesus grew in wisdom and stature and in favor with God and men.” In His human form, He was obviously one of the best and brightest. Also, He first appeared in His public ministry at age 30, which would suggest that he had completed His training as a talmidim and was now ready to make his own disciples. We also know that he was a “tekton” by trade (a craftsman who builds – NIV translates as “carpenter”). From this educational training came the rabbinical system that Jesus was identified with. He was called rabbi in part because He had completed the training and was recognized as one of the very best in His knowledge of the Hebrew Scriptures. In our next lesson, we will look at the different levels or hierarchy of rabbis and the authority they carried in the community.